Now that we know how to attach scripts, let’s look at how we handle input in our game, using both Haxe and Nodes. There are generally two basic approaches to input in any game engine, event driven or polled. In an event driven approach to input you implement callback functions that are called when input occurs, while in polled input in your game loop you generally poll the status of various input devices and respond accordingly. Let’s start by looking at event driven keyboard input using nodes. 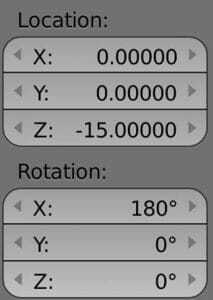 For the following example I’ve moved the camera to the following coordinates so the X,Y values are left/right, up/down. 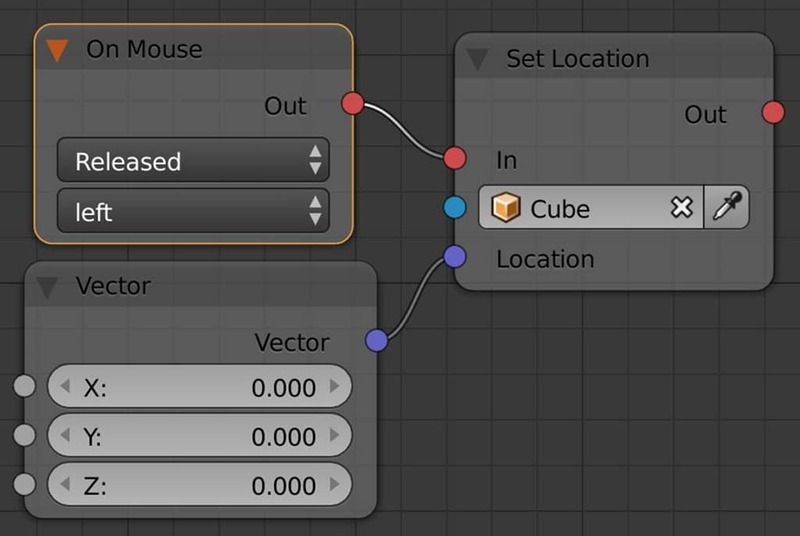 I attach the following script to the an object (such as the default cube) in our scene. This tree is very straight forward, On Keyboard is an event called when the user hits a key on the keyboard. In this case when the “right” key is Down, we move the selected object 0.200 along the right local axis. In English, we move a little to the right when the right key is pressed. This example is simply doing the exact same logic, just for handling the left key instead. Notice we move left by ticking the Inverse button in the Translate On Locale Axis node. The key difference in this example is we are also showing how to poll the status of the keyboard as well. This event is still only fired On Keyboard when the left key is pressed, but we also poll the Keyboard to check if the space bar is down. If the user is pressing the spacebar, we move 4x faster. This shows how you can easily check for multiple concurrent keypresses. 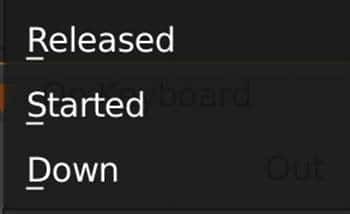 Down is fired whenever a key is down for as long as the key is down. This means the event will be fired over and over as the key is held down. If you want to run your code once per keypress you use either Started or Released. 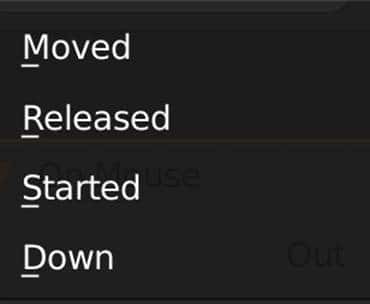 Started is fired when the key is first pressed down, but only once per key press, while Released is called when the key is released, once again only once. Now let’s take a look at handling the mouse using Nodes. This node graph is a bit trickier. Here the process is fired by the On Mouse and ultimately just moves the bound object using a Translate Object node. We need to do some work to figure out how much to move by. We start by checking the mouse position using a Mouse Coords node and taking the Movement output, this is the amount the mouse moved by since last call. We then multiple it by a vector of 0.01,0.01,0.01 to really slow down how much we move when the mouse moves… change these values to change the speed. We don’t need the Z coordinate, so we split it out with a Separate XYZ and set the Z to 0 in a Vector node. 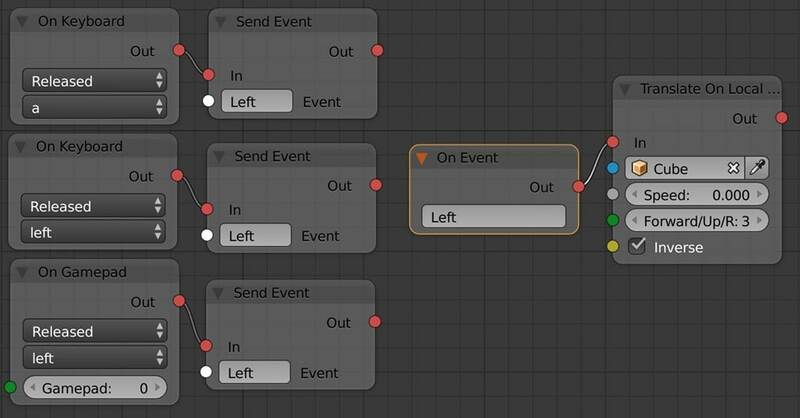 Now when you move your mouse left or right, the bound node will also move left or right. Now let’s show how you handle mouse clicks. As well as options for left, middle and right mouse buttons. In some cases you might want to have the same code fired by multiple different input events. For example you might want to have code to move the player to the left if the user presses the left arrow, the A key or presses left on the gamepad. Thankfully this is easily handled using custom events. 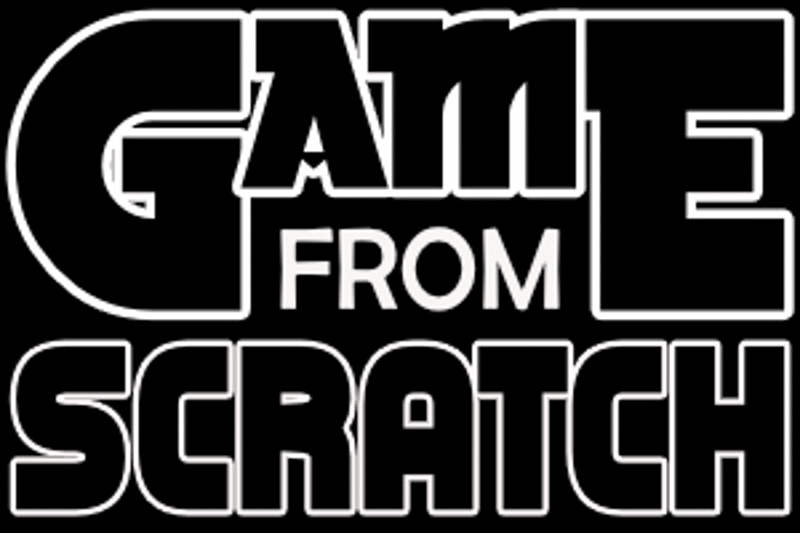 Here in the event of A, Left or Left on the Gamepad we fire the Left event. Then we can use a single event handler to the handle the Left event. Please be aware if you want the Event to be accessible in other graphs, you must use Send Global Event instead of Send Event. Finally, its possible you want to poll for input. We actually did a bit of polling in the above examples, but let’s show a dedicated example. It’s much the same process, but instead of the process being started by a keyboard event, we instead implement an On Update node. If you are used to other game engines, On Update is basically your game loop, it’s a special node that is call every frame of your game and is generally where you will implement your game logic. In this case each frame we simply check the status of the keyboard, if the Right key was just released, we move to the right. Whether you choose polled or event driven is entirely up to you. In this day and age, the performance difference really doesn’t matter, so it all comes down to which code style fits your game best. This example shows a number of things in a short code example. Armory currently doesn’t actually have events that are fired when Input occurs on the Haxe side, but the underlying Kha library does. In this event we declare 2 functions, one that’s called when a key is first pressed and the other called when a key is released. We wire up these two event handlers by calling notify() on the keyboard, passing in our two functions. This example also shows polling, this is done by implementing the notifyOnUpdate() callback, which is called every frame, over and over as long as your game is running. We can get the keyboard by calling iron.system.Input.getKeyboard() which has a series of functions to check different statuses. In this case we check to see if a we was released using the released() function, passing in the description of the key we want to check. These values will match the names we saw earlier when using nodes. We also show how to poll the mouse which we can get a reference to using iron.system.Input.getMouse(). 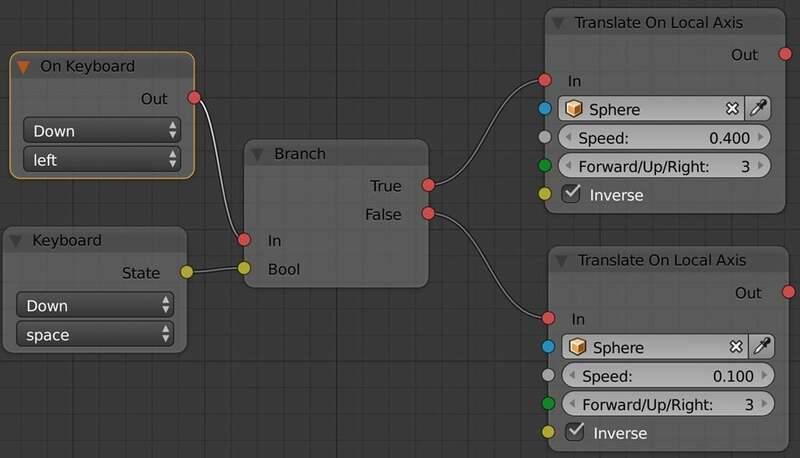 You will notice that the iron library acts as our interface between our code and Blender/Armory. We will be using it A LOT in the future!